This February we’re spotlighting those who lead by example. Organic Spa Magazine’s Beverly Maloney-Fischback articulates this ambition with her green home renovation in Ohio. Among the eco-friendly features of her Rocky River Green Home are, you guessed it, Rainwater HOG tanks! Further afield in national water news, we bring you two articles – one from the New York Times and one from the San Francisco Chronicle – about those who are asking pertinent, if difficult, questions about sea level rise. The primary question is this: How, and when, do we best respond on a national level to the effects of a changing climate on heavily inhabited coastlines? Read on for some thought-provoking answers. In his book, Making, architect Thomas Heatherwick explains that the focus of his work is “how to use materials and forms at a human scale, the scale at which people touch, experience and live in the world.” The Seed Cathedral, designed for the UK Pavilion in the 2010 World Expo, is a breathtaking realization of that focus. It is also a stunning example of how to translate the natural world into architecture. Read more about the Seed Cathedral in the B.U.G. Design section. And speaking of setting an example, don’t miss what RotoWorld Magazine has to say about Rainwater HOG this month. “In lieu of flood control the new philosophy in the Netherlands is controlled flooding,” reports Michael Kimmelman in a recent New York Times article. Kimmelman looks to the Dutch example of water management for lessons that might be useful in New York and New Jersey as they recover from Hurricane Sandy. Multifunctional design – a concept also expressed in HOG tanks – is prevalent in the Netherlands. Offices and retail spaces are built on top of dikes, public squares and garages act as catch basins for rain and floodwater, and recreational opportunities are designed around floating houses and reservoirs. The relocation of farmer Nol Hooijmaihers and his family for the OverDiepse Polder, one of the Room for the River infrastructure projects, demonstrates what, for Kimmelman, is the most powerful lesson of Dutch flood control. In the past century, an 8-inch rise has been charted in coastal waters off San Francisco Bay. Scientists say that by 2050 (that’s 38 years), sea level could rise by 1 1/2 feet as a result of global warming. 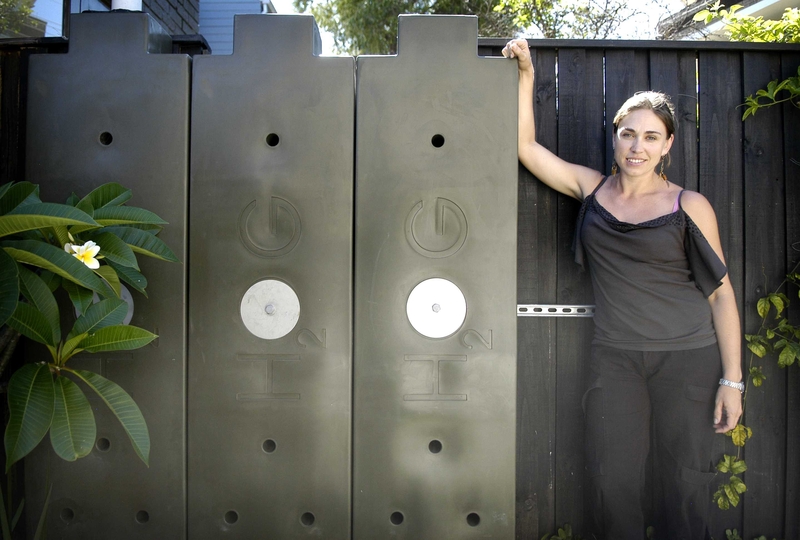 In a recent San Francisco Chronicle article James Temple profiles SF-based, husband-wife architect team Byron Kuth and Elizabeth Ranieri and their ventilated levee design called Folding Water. One of six winners in the 2008 “International Rising Tides” competition sponsored by the San Francisco Bay Conservation and Development Commission, Folding Water is a solution that quite literally pokes holes in traditional knowledge of how to combat sea level rise. Kuth and Ranieri envision a series of 10 to 15 Folding Water levees, “barriers with porous wall that could protect the shore as well as the ecology of the bay” to fully protect the at-risk low-lying areas along San Francisco Bay. For more specifics on the design, click here. 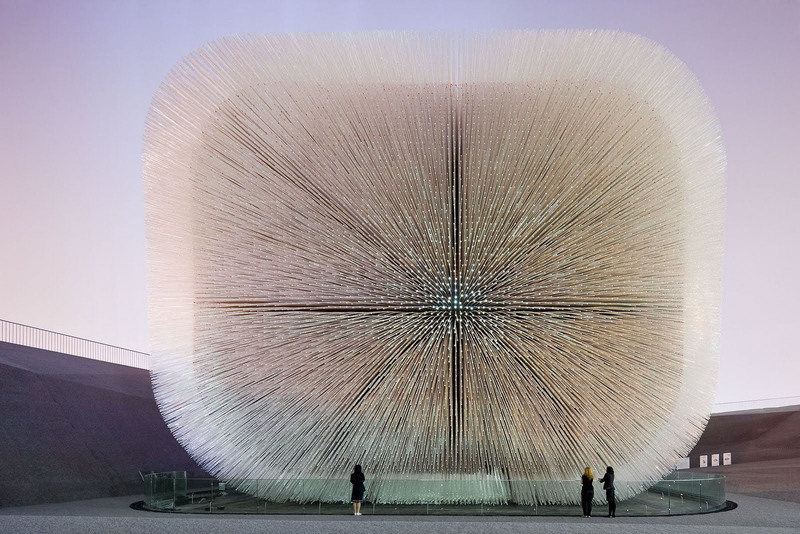 “Our challenge was to do one powerful thing that had clarity,” architect Thomas Heatherwick says of the Seed Cathedral, presented for the United Kingdom’s pavilion at the 2010 World Expo in China. The theme of the Expo was the future of cities, which the Heatherwick team used as a starting point to consider the relationship of cities to nature. To create the Seed Cathedral, they worked with the England-based Kew Gardens, the world’s first major botanical institute, and its Millennium Seed Bank project, with a mission to collect and preserve 25 percent of the world’s wild plant species. photographic perspective on seeds, check out Seeds: Time Capsules of Life, authored by an expert from the Millennium Seed Bank. Why is it beautiful? The Seed Cathedral is a building with texture. Sixty thousand silvery, tingling hairs protrude from every surface and raise the height of the building to six stories. At the tip of each hair (identical lengths of acrylic rod) are seeds encased in a glass-like tip. By day, the cathedral is lit by sunlight. By night, tiny light sources within the rods illuminate the seeds inside and the tips of the hairs on the outside. “They appear as thousands of dancing points of light that sway and tingle in the breeze,” says Heatherwick. A fitting image for a building nicknamed in Chinese, simply, Dandelion. “For this future-gazing Expo, seeds seemed to the ultimate of unfulfilled potential and future promise,” writes Heatherwick in his book, Making. Why is it useful? The Seed Cathedral effectively communicates what is on the inside – 250,000 seeds from the Millennium Seed Bank – from the outside. It surprises with simplicity, and with stunning ingenuity. But it also makes us consider nature in a new light by effectively elevating the humble seed to that of a precious, and rare, stone. What better way to emphasize the importance of nature in our cities of the future? Why is it green? “Inside the Seed Cathedral, you were at the most bio-diverse point in Shanghai,” explains Heatherwick. Those thousands of seeds held, and illuminated, within the cathedral were later distributed among British and Chinese schools and botanical institutions. But truly, Heatherwick Studio succeeded in creating a magical structure that allows millions of people to be wooed, and awed, by the power of the natural world. (He won the gold medal for Pavilion design, too).